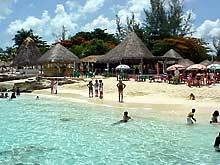 There are lots of things to do in Cozumel, Mexico. One of the tbest known Cozumel activities is scuba diving on its spectacular coral reefs. It seems as if there is a dive shop on every corner, ready to take you on the excursion of a lifetime. 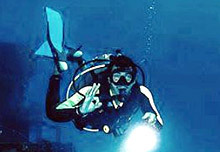 Non-divers can take lessons and become fully certified divers, or you can take a "resort course" and dive under the guidance of your instructor while on vacation. There are plenty of great beaches to visit. The ones facing the mainland tend to be a little more developed with restaurants, shopping, and more people. The beaches on the "other side" range from small restaurants and beach bars to totally deserted beaches - pull off onto the shoulder and have to entire beach to yourself. There is also shopping, exploring, and nightlife to keep you occupied. 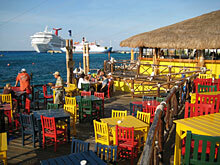 The following is a BRIEF listing of some things to do while on Cozumel. These are in no particular order. 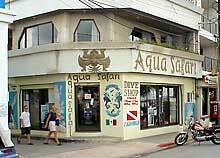 One of the oldest diving shops in Cozumel island, now owned and operated by the third generation. The founder, Ramon Zapata Novelo, was the first diver ever to use the scuba unit around the island, becoming the first pioneer on discovering all the diving sites, reefs, beaches as well as recreational places. This is the most convenient dive shop to our houses - only a half block away. They use small, quick boats for faster trips to the reefs. 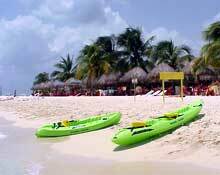 They also offer snorkeling, cenote diving, and deep sea fishing. Visit their website - click here. On Calle 6, toward the ocean from our houses. Decent food, loud music, lots of dancing, and a staff that creates a good time every night. This is the spot that all the other night spots want to be. 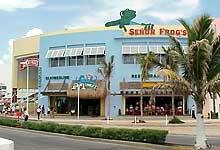 Upstairs is Senor Frog's nightclub. Located on the waterfront near the cruise ship pier in town. This is a bar that is owned and operated by a former cruise ship performer. After leaving the cruise ship business, the owner and his wife decided to open a bar where all their cruise ship buddies could hang out, check email, make phone calls, and take a break from the passengers. Cool off in the pool, snorkel in the ocean, and enjoy the food and drinks. Very laid back mixture of cruise crew, divers, and vacationers. Located on the oceanfront pool deck of the Barracuda Hotel, just south of the cruise ship pier in town. Yes, another branch of the Margaritaville franchise. At least this one is actually in the tropics. Nice deck on the oceanwith an excellent view of the sunset. Located south of the cruise ship pier in town. Chankanaab is like a state park. Nice beach, good snorkeling, two restaurants, nature trails, and a "swim with the dolphins" program. There are also some re-created "Mayan ruins." There are 4 dive shops right on the beach where you can rent snorkel gear and certified divers can rent scuba equipment for a shore dive. It's worth a trip. Go early so you can stake out one of the shade palapas. Later in the day the cruise ship people begin to overrun the place. Located a few miles south of town. Take a taxi. There are lots of taxis there waiting to bring you back. There is an admission charged. 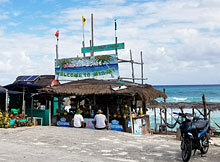 The closest "developed" beach to town, Playa Azul is the typical Cozumel beach operation - restaurant, bar, tables and chairs on the sand, and a nice (but small) beach area. Kids playground. Not much snorkeling material here, but there are jet skis, kayaks, and wind-surfers for rent. Located north of our houses next to the Playa Azul Hotel (but you can't use THEIR beach). Take a taxi. Buccanos has a natural sand beach, swimming pool, seaside restaurant with bar, shade palapas, showers & lockers, beach massage, snorkel equipment & kayak rental, wave runners and parasailing, and internet that reaches the beach. Admission fee is charged. Go early - it can get very crowded with cruise ship people. If you go to the far right side of the property you won't end up surrounded too bad by the crowd. Food is good; drinks are watered down. Stick with beer or sneak in your own. Located a few miles north of town. Take a taxi. There will be lots of taxis there waiting to bring you back. This beach is south town, a few miles beyond Chankanaab Park. 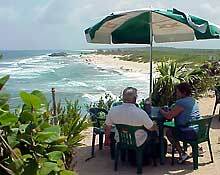 Features restaurant, bar, tables and chairs on the sand, and a long sandy beach area. They've joined the trend of "all inclusive." You can pay a fee and enjoy food, drink, nice lounge chairs, etc. OR you can go into the "cheap seats" and pay as you go. Not much snorkeling material here, but there are jet skis, kayaks, and wind-surfers for rent. The bar has a very large selection of good tequilas for sipping. Located several miles south of town. Take a taxi or a rental car or scooter. If you rent a car or scooter you can take the one road across the island to the other side, about 15 kilometers (about nine miles). That side is undeveloped except for some funky little beach bars strategically located every few miles. Watch the road - sometimes there is literally no shoulder due to storm erosion. There are miles of empty beach. Pull off the road and have a few miles all to yourself. Located on the other side, naturally. This beach bar on the "other side" is not actually on the beach. It overlooks the beach from high atop a breezy cliff. You park at the base of the hill, walk up the short jungle trail, and come out at the palapa bar. Great view. Located a few miles south of Punta Morena on the other side. This place goes by several names - Coconut Cabana, The Liquor Box, and now Bar Miami. It seems like whenever a piece of wood with a name on it washes up on the beach, they nail it to the structure and that becomes the new name. At first glance it seems like a rundown shack but YOU MUST STOP HERE! Home of the world's best mojito. On the "other side" on the beach toward the south end. A natural geological feature on the oceanfront. On typical windy days, the waves crash into the rocks and the water follows a hollow "pipe" and shoots out of the rocks several yards from the ocean. All this is accompanied by a loud whooshing sound. There is no sign and no special parking, just a wide spot where people pull off the road. On the "other side" just north of Bar Miami. 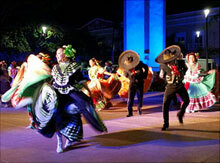 Sunday night is fiesta time in the main plaza downtown. There is a Mexican band and lots of dancing by locals and tourists. This is date night for the locals. Families come with the kids dressed in their cutest outfits. Older kids come so the boys can check out the girls and vice versa. Admire the new lighted fountain and get your hair braided by experts. Sometimes, in addition to the band the local schools or dance studios put on a music or dance recital. Located in the middle of town, near the waterfront. One of Cozumel's oldest dive operators. They have several large boats with plenty of room and a head (bathroom) and a smaller fast boat for small groups. Top quality rental gear and a good safety record. Located in town on the waterfront between Calle 5 and Calle 7. 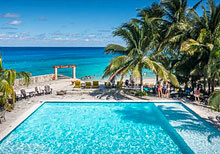 The two homes featured on Rentals Cozumel are offered directly by the owner in the United States. Tell whoever answers the phone that you are calling about the houses in Cozumel.